Add trunk loads of style to your next event with these silver finish elephant place card holders as favours. 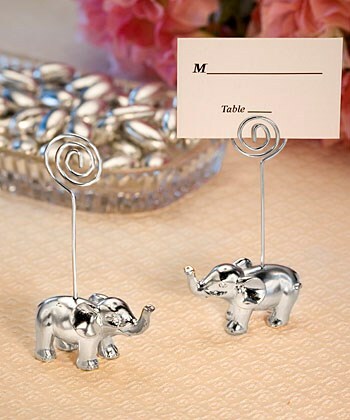 They say an elephant never forgets and your guests will surely never forget seeing these adorable place card holders when they pick up their seating arrangements. Each sturdy silver finish cardholder measures 4" x 2" x 1.5" with an elephant base and wire coil extending above to hold the place card or a note or photo once your guests take them home. Sure to bring good luck to your day, these favours come in an individual poly bag with place cards included.